This time, it is not N reviewing, it is KazeYoja… Yes, same old me! 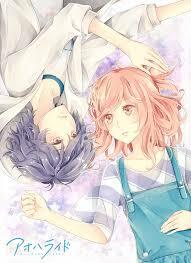 I will be reviewing a much anticipated anime: Ao Haru Ride (also known as Blue Spring Ride). Why was it anticipated? The manga had a great success (especially among girls) and many fans were waiting impatiently for the anime version to be aired. Before unleashing my stormy comments, let’s see some basic information about the anime: the manga was created by Io Sakisaka and re-edited since January 2011. It counts 11 volumes till August 2014 and still ongoing. The anime adaptation was aired from July till September 2014, and counts 12 episodes of 23 minutes each. Aaaaannnnnd, it is a high school shojo! The story revolves around Futaba Yoshioka, a high school student who, upon leaving middle school, decided to change herself. In fact, during middle school, she was popular among boys, which made her despised by girls and leaved her without friends. In high schools, she “deletes” every girly and cute action from her behavior in order to make friends. One day, she accidentally meets Tanaka, her crush from the middle school era, who suddenly disappeared years ago. Only, he is taller, grown and totally different from what she recalls… also, he goes by the name Kou Mabushi now. Futaba is resigned to make the old lively and gentle Tanaka back to the surface, but how can she when even she is changed herself?? We embark on this journey with our two heroes as they try to be true to themselves, make friends and discover their feelings for each other. Frankly speaking, there were many questions that made me come for the next episode: why has Tanaka changed his name? Why is he so distant with his brother? Does he love Futaba or is it a lost cause? I loved the first 2 episodes; they set the mood and gave us the needed context to understand these characters and their stories…. How things evolved from there were completely common! I mean monologues about Futaba’s thoughts and doubts and analyzing every single small gesture of her crush! He smiled? Well that means he is soft inside and we see a flash back to when he smiled when he was younger! He turned his head? “Is he ignoring me? Am I annoying him? Where is the old Tanaka?” And another flash back to his smiling face! Sure, I am exaggerating but this is how I felt at first… then I started a game out of it: detecting the “cue monologue” signs! oh, and there were many « cue tears » signs also! The side stories were really just fillers and added as an attempt to divert us from the main storyline. But it didn’t succeed: no development of their characters or their choices. Besides, they were defined just with one trait: the overly cute girl, the overly silent girl and the affectionate brother. That is it! This wasn’t enough for any other developement. Except when the overly cute girl “decided” (yes I am sure of my words choice here) decided to fall in love with Tanaka too, giving us 3 more episodes of a love triangle and “cue monologues” about friendship versus love. Some people liked the OST but not me… it was kind of normal ballads… didn’t cut it for me, sorry again! However, there were some good points: the drawing style is really amazing! It is different from what I have seen before and truly portraits all the characters emotions! I mainly watched because of it. Another aspect that I appreciated was that there were some deep and emotional moments, especially towards the end of the anime. I precisely liked the train/metro scene where Futaba waited for Tanaka to get off and realized her true feelings for him. During these moments, we are truly immersed in the situation and can feel the pain or the struggle of each character! Those were the highlight moments for me! From where I stand, I am guessing that the anime and story targets a younger generation of girls and that is the audience that it gets! From what I see, all the teenagers that followed the anime didn’t see any flaws: perfect story, flawless Tanaka and super cute Futaba…. So, if you are a teenager, you should probably watch it… but if Shojo isn’t something that you enjoy, my recommendation is to keep looking! Finally, there is a live adaptation of the anime, a Japanese movie that will star Tsubasa Honda and the handsome Masahiro Higashide. I hope that the story in the movie and its realization will be better! Movies are different form animes, right? Next articleManga Addiction, un groupe Facebook pas comme les autres !